Saturday May 18th means fun, food and shopping when Glendale hosts its' annual Spring Fest. 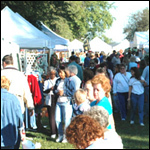 A wide array of craft, antique and gift booths will be scattered around this tiny town, tempting you to stop and browse, plus there will be live music in the park. Plan to spend a fun-filled day in the country at Glendale's Spring Fest! For booth rental information, contact Sheree Vance at (270) 369-6188. Our vendor list is full for 2019! For the past 41 years, the town of Glendale has sponsored their annual Crossing Festival on the third Saturday in October. With hundreds of booths featuring food, crafts, antiques and more, the Glendale Crossing Festival is a shoppers paradise. Be certain to mark this on your "don't miss" list for 2019 - there's even a parade! For more information, contact Sheree Vance at (270) 369-6188. For vendor information, call (270) 369-6188 and leave a detailed message for Sheree Vance. Thanks and we look forward to seeing you in town on October 19th! December is a wonderful time to enjoy a visit to Glendale. The first Saturday in December holds a fun-filled day of holiday spirit and excitement. Come celebrate Christmas the old fashioned way! we had in Glendale Kentucky?"